The word duck comes from Old English *dūce "diver", a derivative of the verb *dūcan "to duck, bend down low as if to get under something, or dive", because of the way many species in the dabbling duck group feed by upending; compare with Dutch duiken andGerman tauchen "to dive". Contrary to popular belief, not all ducks actually quack! It is generally known that it is only really the females of most duck species that actually make a quacking sound. All ducks actually have a wide range of calls that they use to communicated with one another including whistles and grunts! 1.Airplanes in America collide with an average of 100 ducks a year (according to federal records). 2.Ducks are comfortable walking on ice and swimming in icy water because their feet have no nerves or blood vessels making the duck unable to feel cold. 3.Ducks are everywhere except Antarctica. 4.Ducks can store up to a quarter pound of food in their esophagi. 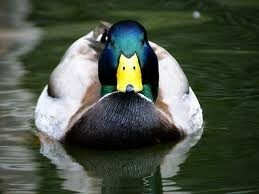 5.Ducks date back to 65 millions years ago.